Sussex have agreed to release fast-bowler Stuart Whittingham from his contract. The 24-year-old will join Gloucestershire with immediate effect. After making his way through Sussex’s youth pathway, he signed his first professional terms with Sussex during the 2016 season. He made his first-team debut during the same campaign and took 37 wickets in 13 first-class appearances for the county. “It’s been an honour to represent Sussex and has always been my proudest achievement,” the Scotland international said. “However, with first-team opportunities uncertain over the next season, I feel that I’m at an age where I need to be challenging to play as much first-team cricket as possible. “The opportunity to do this with Gloucestershire was too good to turn down and provides me with a new and exciting challenge to carry on my cricketing development. “I feel very fortunate to have represented such a great club and will look back fondly on my time here at Sussex. 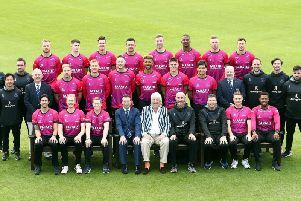 Sussex director of cricket Keith Greenfield explained the decision to agree to Whittingham's request: “Stu is a talented cricketer but with the fast bowlers we currently have here at Sussex, first team opportunities might have continued to be limited in the coming seasons. “With Stu’s best interests in mind, we’ve agreed to release him with a year remaining on his contract to give him the best opportunity to further his career. Head coach Jason Gillespie added: “It’s a great opportunity for Stu at Gloucestershire. He did not play as much first-team as he would have liked in 2018 and with a number of bowlers at the club challenging for spots, opportunities may again be limited in 2019.